But recent bilateral talks will not become another Yalta Conference. Summary The United States and Russia have been engaging in high-level negotiations over Ukraine and the status of Eastern Europe more broadly. Both countries have fundamental strategic interests at stake and several cards to play. Russia is counting on its involvement in Syria to strengthen its hand, while the U.S. can fall back on NATO and military rotations through Central and Eastern European countries. There are few places that evoke collective feelings of fear and betrayal the way Yalta does for the residents of Central and Eastern European countries. The seaside town in Crimea was the site of a historic meeting in February 1945, where U.S. President Franklin D. Roosevelt, Soviet leader Joseph Stalin and British Prime Minister Winston Churchill decided the fate of post-World War II Europe, shaping the formation of western and eastern blocs on the continent. For Central and Eastern Europe, Yalta has become a symbol of Western geopolitical considerations trumping their own aspirations for freedom and independence. Today, watching high-level negotiations between the U.S. and Russia over Ukraine and Syria, the greatest fear for the region’s governments is another Yalta moment – a moment when the U.S. opts to grant Russia significant concessions in Eastern Europe in order to make a deal. But a Yalta-style deal between Washington and Moscow is not coming. Washington’s ultimate goal is to reach a negotiated settlement on the status of Ukraine, whether formally or informally, that would allow Ukraine to be at the very least militarily neutral, while also deterring Russian assertiveness and limiting Russian influence in the region. Executives’ optimism wanes—suggesting concern about where the economy’s heading in 2016—while their company views hold steady. A common worry is slowing growth in China, which many cite as a threat to global growth. Executives’ outlook on the economy is cautious and uncertain in McKinsey’s first survey of the year on economic conditions.1Compared with the previous survey in December, when opinions took a buoyant turn, respondents are now more likely to report negative than positive views on both global and domestic economic conditions. Executives’ outlook on the economy is cautious and uncertain in McKinsey’s first survey of the year on economic conditions.1Compared with the previous survey in December, when opinions took a buoyant turn, respondents are now more likely to report negative than positive views on both global and domestic economic conditions. This downward turn is especially pronounced in developed markets, where, in the second half of 2015, executives were much more bullish than their peers in emerging markets. At the same time, their expectations for their companies remain strong. Eight in ten executives expect that demand for their companies’ products and services will grow or stay the same in the coming months, and a majority believe (as they have in every survey since 2011) their companies’ profits will increase. * Why is India so keen on importing US nuclear reactors that even the US doesn't seem to want? A report by the Institute for Energy Economics and Financial Analysis, an independent organisation in the US, has warned that India’s plans to import 12 nuclear reactors from ailing American equipment suppliers is financially fraught and irrelevant for India’s electricity needs. The release of the report titled “Bad Choice: The Risks, Costs and Viability of US Nuclear Reactors in India” on Wednesday coincides with Prime Minister Narendra Modi’s visit to Washington to attend the Nuclear Security Summit. The proposals for six Westinghouse Electric’s AP1000 reactors in Mithi Virdi, Gujarat, and the same number of GE-Hitachi’s Economic Simplified Boiling Water Reactor in Kovvada, Andhra Pradesh, are part of the Indian government’s return gift for Washington’s cooperation in concluding the Indo-US nuclear deal. Why do the Owaisi brothers turn contemptible towards the idea of India every now and then? It is because the Shi’as have no prospect in Indian politics. They manage to get a seat or two sporadically in some corners of the country where Muslims have totally given up on other parties that practise minority politics. But to ensure even those few seats, these Shi’as have to go over the top; they have to sound more rebellious, belligerent and outrageous. There is no other way they can make some Sunnis vote for them. The controversy over the slogan “Bharat Mata ki Jai” (Victory to Mother India) refuses to die, as columnists of some standing continue to fill editorial space with arguments for and against the motion in broadsheets. The interesting point to note in this debate, however, is why several Muslims who were till the other day up in arms against Bankim Chandra Chattopadhyay’s “Vandemataram” have suddenly turned around in support of the nationalists and against Asaduddin Owaisi and Majlis-s-Ittehad-ul-Muslimeen’s opposition to the contemporary slogan “Bharat Mata ki Jai”? Why is the objection not so vociferous this time? It is not because the Owaisis are descendants of Razakars (volunteers) who fought against the Union of India to keep Nizam’s Hyderabad independent and these Muslims were against the Razakars in that fight. What the success or failure of the Tata group’s various initiatives show is that big conglomerates cannot be driven by a promoter culture. They must be capital allocators. Under JRD, the Tatas shared values, but entrepreneurship was provided by talented CEOs. Under Ratan Tata, the group became more important than the company, and this led to mishaps. The big successes often came when the group left managers to do their own thing. The Tatas have accepted defeat, after throwing a few billion dollars down the Corus drain. In an announcement yesterday (30 March), the group said it will be selling Tata Steel (UK), the erstwhile Corus Steel’s British operations, but will keep the Netherlands part, which is at least profitable. It is unlikely that there will be too many suitors rushing to buy Tata Steel UK in a downbeat global steel market, but that is another story. The news is that the group under Cyrus Mistry has finally accepted that buying Corus in 2007 at a huge premium was a disaster. While contested takeovers do often bring with them the winner’s curse of having overpaid for an asset, the Tatas are not unique in having made this mistake. What they will probably not admit is the two underlying mistakes that enabled this unwarranted gamble on Corus: a mistaken belief in conglomerate culture, and an even more mistaken belief in giving the promoter too much say in how capital is allocated within the group. Why is Roy not paying up despite having the assets worth Rs 1.8 lakh Crore? Why is the Supreme Court itself not doing the obvious: that is, put the group under a receiver/administrator, who can then inventory the properties, sell the ones which are unencumbered, collect the dues, and then let Roy go free? Given that prima facie Roy has defied the court (that’s why he is in jail), why has the court not convicted him for contempt? Why is there complete radio silence in political circles in Roy’s case? Why has no politician condemned Roy when they are willing to chase Mallya to the end of the earth? Is it because Roy knows too much about them? The Sahara case is getting curiouser and curiouser. Jailbird Subrata Roy, bossman of the Sahara group, has been in Tihar for more than two years but is showing no eagerness to come out. The Supreme Court is exasperated but has not found a way to make him pay his bail amount and get out. Politicians are quiet, despite being on bum-chum terms with Roy. Sebi has been twiddling its thumbs on Roy, attending court hearing after court hearing, without anything to show for its patience. We’ve just published a report that explores what we believe are unacceptably high risks and costs of the Indian government’s proposal to build 12 new nuclear reactors. Our study, “Bad Choice: The Risks, Costs and Viability of Proposed U.S. Nuclear Reactors in India,” finds the plan, which would put six reactors each at Kovvada and Mithi Virdi, to be fraught with financial and operational hazard. FIRST, TO THE KOVVADA PROJECT, WHICH INVOLVES A NEW, UNTESTED ESBWR REACTOR DESIGN from General Electric-Hitachi that has never been operated at a commercial nuclear plant and is not under construction anywhere else. The history of such untested first-of-a-kind reactors shows that they typically cost far more and take far longer to build than expected and that they experience unanticipated problems both during construction and when they begin commercial operations. The estimated cost of the four new design Westinghouse A1000 reactors under construction in the U.S. has increased by more than 20 percent since construction began three years ago, and the reactors’ estimated in-service dates have slipped by about three years. Additional cost increases and schedule delays at these projects are likely, if not certain. India will purchase some 245 U.S.-made Stinger air-to-air missiles along with launchers and engineering support for its burgeoning fleet of light attack and attack helicopters, according to a press release by the U.S. defense contractor and missile maker Raytheon. Raytheon notes that an agreement for the purchase of the weapon system has been signed this week by India’s Ministry of Defense and the U.S. Department of Defense. The procurement of the Stinger air-to-air missile is part of a $3.1 billion deal with the United States that includes combat helicopters, weapons, radars and electronic warfare suites. Variants of the Stinger missile system are in service with the militaries of 29 nations. The weapon system has been used in combat in a number of major conflicts including the Afghan-Soviet War, the Angolan Civil War, the Yugoslav Wars, the Chechen War and the Falkland War. Raytheon claims that it has shot down more than 270 fixed and rotary wing aircraft. Last year, the United States sold Stingers to South Korea, Taiwan, and Latvia. The government has decided not to join a U.S. maintained global terror database in the face of objections from the intelligence agencies. Unhindered access to the Americans to the database of terror suspects in India, which includes their biometric details, was opposed by both the Research and Analysis Wing (R&AW) and the Intelligence Bureau (IB), a senior official in the security establishment said. The proposal has been stuck since it was initially proposed by the U.S. in 2012. A model text of the proposal — the Homeland Security Presidential Directive (HSPD-6) — was to be discussed at a bilateral homeland security meet to be held in June this year. The HSPD-6 is an agreement for exchange of terrorist screening information between the Terrorist Screening Centre (TCS) of the U.S. and a selected Indian security agency. The TCS has the database of 11,000 terror suspects. There have been several rounds of discussions between India and the U.S. in the past one year on the issue. Both sides narrowed down their differences on several key aspects. Curriculums that appear to sanction bigotry are now standard in K-12 government-approved schools. Leaders of the Sunday bombing in Lahore first attended such schools. WASHINGTON — The Easter bombing of civilians in a park in Lahore follows a long rise of religious extremism in Pakistan and a poisoning of public opinion towards minority faiths. The jihadist group that claimed responsibility for Sunday's suicide bombing said they had targeted Christians, though most of the 72 killed were Muslims. On the same day, thousands of radicals began a four-day sit-in in Islamabad over the execution of a bodyguard who killed a provincial governor who had been a voice for religious tolerance. Thank you for providing me with this opportunity to be in the great city of Dhaka and be in the BRAC University addressing this august gathering. But this interaction can only be meaningful if you ask me questions. I will answer your questions honestly and candidly. Hopefully, we will add to each others' knowledge in this interaction. Historicizing a personal narrative is difficult in the best of times. Recalling 1971 is a very sensitive issue and it touches most of us very deeply. First, a litte of the personal: I was in Dhaka at the Army Ordnance Depot at Tejgaon from 1962-1964 and in 3 Commando Battalion at Thakurgaon and Chittagong from 1965-1966. As an army officer, I also happened to know several Bengali officers who later became major players in Bangladesh. Among them, General Zia-ur-Rehman was a fellow instructor at Pakistan Military Academy. Brigadier General Khalid Musharraf was my roommate and course mate at Military Academy and a fellow officer in the commandos in the early sixties. General Mir Showkat Ali was also a course mate in the Military Academy. Major Ziauddin of the Naxalites and now a maulana is a personal friend. Brigadier Abu Tahir was a fellow officer in the commandos and a friend too. Many of my students at the Pakistan Military Academy also rose to high ranks in the Bangladesh Army. A recent report from the US Congressional Research Service outlines China’s 2.3 million member armed forces and sheds light on misconceptions from Western military analysts. Simply put, the report challenges the idea that Westerners can understand China’s military and foreign policy decisions without first understanding their Chinese philosophy and culture of warfare. Unlike the US, China has a media apparatus that is controlled by the state, so their military reports lack the transparency established by a free press. China also has a fundamentally different understanding of aggression. For the Chinese, there is little difference between peacetime and wartime cyber espionage, and they have engaged in stealing military secrets from the US and others because they can. Specifics of the report, detailed below, show how China has stepped up to rival the US’s military might in the Pacific. The Yiwu-Tehran train is a significant part of Beijing’s plans for regional integration. The freight train from China that pulled into Tehran a little over a month ago created history by becoming the first train to revive the ancient Silk Route between China and Iran. Ferrying 32 containers of cargo, it left Yiwu in China’s eastern Zhejiang province on January 2, snaking its way through Kazakhstan and Turkmenistan before entering Iran. It took the train 14 days to cover the roughly 10,399 km long journey to Tehran. Part of the overland component of China’s One Belt, One Road (OBOR) initiative, the Yiwu-Tehran rail link slashes travel time between China’s east coast and Iran. Its arrival “in less than 14 days is unprecedented,” the head of the Iran Railways company Mohsen Pourseyyed Aqai said. Ferrying cargo via the sea from Shanghai, which lies 300 km north of Yiwu, to the Iranian port of Bandar Abbas takes 45 days in comparison. The China-Iran “Silk Road train” will run once a month. Its frequency will increase as trade picks up. China’s economic co-operation with Iran, which deepened through the sanctions period – bilateral trade grew from $4 billion in 2003 to $53 billion in 2013 – is expected to soar in the coming years as Beijing and Tehran are eyeing stronger trade ties. In January, during the visit of Chinese President Xi Jinping to Iran, the two sides agreed to increase trade to $600 billion over the coming decade. It may be time for Beijing to rethink its reluctant partnerships. At a conference in China recently, a Chinese scholar seated next to me made the following ominous comment: “The United States is building up its alliances to surround and contain China. But China can also build up alliances to counter the United States.” Many Western strategists are, of course, dismissive of such warnings, on account of Beijing’s long-touted conviction that alliances are outdated and irrelevant. To boot, those states closest to Beijing, such as Pakistan, Laos and North Korea, are not particularly powerful and may form more of a burden than a benefit to Chinese foreign policy. But as a recent article on this forum illustrates, some major Chinese academic strategists continue to advocate for a change in China’s approach. China is developing two new stealth fighters, stealthy unmanned aircraft, new cruise and ballistic missiles; however, Beijing thus far has not attempted to develop a new bomber. Instead, the People’s Liberation Army Air Force relies on the upgraded Xian H-6K—a derivative of the antiquated Soviet Tu-16 Badger—which is armed with a host of cruise missiles. But given the size of the Pacific and the ranges both American and Chinese aircraft would have to fly over in the event of a conflict, it would be logical for Beijing to develop a long-range bomber that could strike at some of the more distant U.S. bases or to attack U.S. Navy carriers at sea. Moreover, if U.S. forces struck at the Chinese mainland during a war—perhaps over Taiwan—Beijing would only have two options with which to strike back. One would be nuclear weapons—which would signal the start of World War Three—or non-kinetic cyber-attacks. But it would have to means to strike back with conventional weapons. There have been persistent rumors that China has tried to purchase the Tu-22M Backfire production line from Russia, but those have usually not panned out. But it would make sense if China had made an attempt to purchase the Backfire line—much of Beijing’s vaunted anti-access/area denial strategy is drawn from the Soviet Union’s plans to cut off Europe from North America if the Cold War ever turned hot. The Soviets, too, envisioned a combination of submarines, ships and bomber-launched cruise missile barrages overwhelming a carrier strike group. Only part of the Chinese version of the strategy that is new is the anti-ship ballistic missile component. That massive Russian air strikes and a determined infantry and armor assault by the Syrian Arab Army (SAA) on the ancient city of Palmyra could dislodge from it a few hundred or at most a couple thousand Daesh (ISIS, ISIL) fighters is not all that surprising. The question is what it tells us about Russian/ Syrian strategy and about the situation on the ground in Syria. First, the SAA lost Palmyra because it was overstretched. It was trying to defend Damascus, Homs, Hama, Latakia and West Aleppo, along an inherently indefensible Y where some 70% of Syrians live, and of which the regime of Bashar al-Assad all along retained control– though it almost lost Homs in 2013 and almost lost Aleppo in summer-fall 2015. Palmyra, out in the eastern desert, was not strategically important enough to Damascus to invest the resources needed to retain it. The commander of the Qods Brigade (Jerusalem Brigade), the special operations unit of the Iranian Revolutionary Guards Corps, Qasem Soleimani, is said to have urged al-Assad to focus on the compact “Y” and to let Palmyra go. The regime lost some lucrative gas fields near the city, and Daesh tried to use Palmyra as a base from which to cut the trunk road to Hama, but on the whole the decision seems to have had few downsides militarily. Moreover, as the opposition pointed out, the fall of Palmyra was a propaganda windfall for Bashar al-Assad. All but 15,000 of Palmyra’s 70,000 people promptly fled Daesh rule, suggesting that the Baath regime was in fact preferable to that of the phony caliphate. And Daesh predictably damaged the spectacular archeological treasures of the ancient Roman outpost, drawing Western attention and implicitly again suggesting that even al-Assad rule was better than that of Daesh. (The opposition angrily asked why so much world attention focused on some old columns being destroyed but not on the deaths of hundreds of thousands in the civil war). 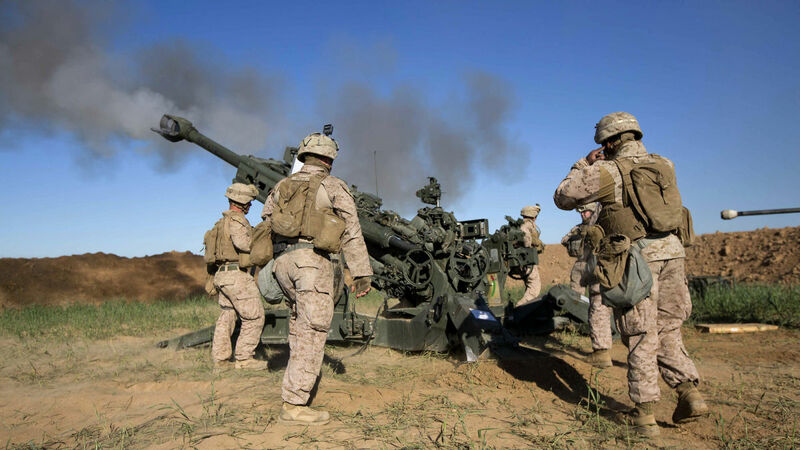 America’s front line facing the Islamic State is more than two thousand miles from Brussels, as the crow flies, and then another ninety minutes by country road from the Kurdish capital of Erbil, in northern Iraq. The trip to Camp Swift, in Makhmour, the forward U.S. base, can be deceptively pastoral. I was slowed by a flock of sheep and goats crossing the road to a grassy plain sprinkled with budding yellow wildflowers. A curly-haired eighteen-year-old sheepherder, Mustafa Maghdid, picked up a young lamb to show me. A woolly white ram played at his feet. Millions of Iraqis fled as ISIS blitzed through the north, in 2014, but a determined few have been reluctant to surrender their herds or small farms. Tales of ISIS’s plunder are rampant. There is little left, according to the war grapevine, for those who may one day want to return. The farming district of Makhmour is also one of the areas where ISIS has used primitive but deadly forms of chemical weapons—mustard gas and chlorine—since last August, most recently last month. It’s also the place where a Marine was killed this month by ISIS rocket fire. He was the second American killed since the U.S. withdrawal from Iraq, in 2011. There are only 5,000 U.S. troops in Iraq-about what a colonel usually commands. But for this ISIS war, as many as 21 generals have been deployed. Why? At U.S. headquarters inside Baghdad’s fortified Green Zone, even majors and colonels frequently find themselves saluting superiors at a pace that outranks the Pentagon and certainly any normal military installation. With about 5,000 troops deployed to Iraq and Syria ISIS war, that means there’s a general for every 416 troops, give or take. To compare, there are some captains in the U.S. Army in charge of that many people. Moreover, many of those generals come with staffs and bureaucracy that some argue slows decision-making against an agile terror group. So says Matthew Bunn, Co-Principal Investigator at the Project on Managing The Atom, at Harvard’s Belfer Center. As I have written many times on this blog, the Islamic State, al Qaeda in the Arabian Peninsula, Boko Haram, etc. have a burning desire to inflict catastrophic damage against the West, and in particular the United States. As evidence, the below from an influential Saudi cleric: “If Muslims cannot defeat the kafir (unbelievers) in a different way, it is permissible to use weapons of mass destruction, even if it kills all of them; and, wipes them and their descendants off the face of the Earth,” Saudi jihadi cleric Nasir al-Fahd. And I have previously written and posted articles regarding previous attempts by ISIS to either obtain illicit nuclear material, as well as the surveillance, and recruitment of nuclear plant personnel as was the case in Belgium. The terrorist attacks in Brussels on March 22, following those in Paris last November, mark a turning point in the modern history of Europe. The European Union had already been weakened by a perfect storm of crises – the hemorrhaging of the eurozone, the Russian invasion of Ukraine, a Biblical tide of Middle Eastern refugees and the growing threat of “Brexit”. A terrorist sanctuary in the Molenbeek neighborhood of Brussels, the very heart of Europe, only underlines the grim reality that the European Union must adapt to new forces transforming global politics or risk the fate of previous imperial experiments to unite the continent, all of which ended in failure. Critics go too far when they call Belgium the Afghanistan of Europe, though both Belgian and European authorities underestimated the dangers posed by what the BBC calls “gangster jihadists” – criminal young men radicalised by the war in Syria who used Brussels, where one quarter of the population is Muslim, as a base of operations for a string of attacks in Europe. More broadly, it appears that leaders intent on building Europe into a “post-modern” superpower have their priorities wrong – a fundamental shift to make Europe secure and geopolitically competitive is essential to sustain the viability of the European Union. For Apple, the standoff with the FBI was a sales pitch – a grandstanding and gratuitous advertising opportunity. Right to privacy is important but not paramount, especially when societal and national considerations are on the line. Fear of abuse can’t deny the state its powers in a milieu where terrorists’ instructions travel through the internet and satellite phones. That the FBI pursued its mandate in l’affaire Apple Computers by getting the Apple smartphone, found on the deceased Californian terrorist at San Bernardino, hacked with help from an outside agency, is a good news. The outside agency would be vilified by the privacy enthusiasts or hailed as an ethical hacker while Apple will have to sulk and eat humble pie. Apple was indulging in grandstanding by ostensibly taking up cudgels for its millions of customers, who in turn supported Apple. In the process, both put privacy on a pedestal higher than the nation’s security. Apple had in mind the enormous and sharp shift in its growth chart. In other words, for it, the standoff with the FBI was a sales pitch – a grandstanding and gratuitous advertising opportunity bordering on gorilla marketing, riding on the enthusiasm of its customers and privacy enthusiasts. It also reckoned that no terrorist would store such ‘devastating’ secrets so close at hand. And it also reckoned that it alone had the expertise in hacking, albeit in the capacity of a manufacturer. In the process, it underestimated the power of hackers, both ethical and cynical. Security researchers recently discovered that the power outage in the Ukraine in December was caused by a malware and identified as an evolved version of BlackEnergy. This Trojan, dating back to 2007, was a popular malware that was previously sold in Russian underground sites. However, its design and architecture changed from performing simple HTTP DDos attacks to modular functional strategy implementation. The latest version of this Trojan is now capable of dropping rootkits, performing stealthy approaches and backdoor commands via a CnC server. It is also worth noting that it is highly speculated to be utilized by a group of attackers that are against the government of Ukraine. Since Stuxnet, this BlackEnergy cyberattack is another of its kind since it also managed to sabotage an industrial sector and that the group responsible for the power outage was also linked to the Trojan found in the mining and railway sector of Ukraine. Industrial systems typically electrical, power, oil or water uses Industrial Control Systems (ICS), which are used for control, supervision and data collection. Usually, the ICS are on an isolated network and, although still part of the network, rarely have limited access to the internet. It is interesting how BlackEnergy managed to get inside these systems. Later during our analysis, we gain insight on what happened and how the group managed to infiltrate the network from the initial stage of the attack via a phishing email. This blog will focus on the analysis of BlackEnergy, parts of its core components, as well as how ThreatTrack’s ThreatAnalyzer and ThreatSecure provide us the information needed for data intelligence gathering. We’ll leave the analysis of the plugins that BlackEnergy utilized for another separate blog. Software in the nuclear missile system will be upgraded as defence officials admitted there was “legitimate concern” about threats from cyber hackers. The Trident missiles, which are shared with America, will be updated amid growing worries defence computers and systems could be vulnerable to cyber attacks from Russia, China, groups such as Islamic State or organised crime gangs. A former Defence Secretary last year warned that the deterrent was unreliable unless the Government could ensure it was free of cyber weak spots that might be targeted. You might not know this, but the Internet wasn’t built for you and me. Back in the 1960’s, which somehow seems like an eternity ago, DARPA (Defense Advanced Research Projects Agency) envisioned a network of computers that could collaborate on scientific and technological research projects from coast to coast. The name given to this proto-Internet was ARPANET, and by 1969, it represented the framework and series of standards that would later become the Internet as we know it today. These days, DARPA is still developing breakthrough technology to answer the increasingly complicated demands of global security and defense. One of those demands, inevitably, is the ever-greater risk of cyber-attacks — both from within the United States and from without. To speak plainly, the amount ofstuff on the Internet makes it more and more difficult with each passing day to keep our personal information — to say nothing of state secrets — safe from prying eyes. This tug-of-war has become something of a full-time job over at DARPA. Here’s how they’re preparing themselves — and the country at large — for the newest threats to cyber-sovereignty. March 28, 2016: European aerospace firm Airbus recently signed a $160 million contract to manage two German MILSATS (military communications satellites) through 2022.Airbus has already been doing for the German military this since 2006. The two satellites (COMSATBw1 and COMSATBw 2) are relatively new with one becoming operational in 2009 and the other in 2010. Each weighs 2.4 tons. Airbus will manage the ground stations and the ability of German land, air and sea forces anywhere on the planet to communicate with each other and anyone else via analog (voice) or digital (for anything). These encrypted links also provide access to the Internet. These two German satellites are similar to the six larger (six ton) American AEHF (Advanced Extremely High Frequency) satellites in orbit. The first AEHF satellite was launched in August 2010. Like the German satellites it uses a permanent fixed 36,000 kilometer orbit. Like most current communications satellites AEHF was built to last 14 years. AEHFs replaced the older MILSTAR birds, providing more abundant and reliable (jam-resistant) communications, just like the two German satellites. Germany is finding that, like the Americans, the major consumer of all the additional bandwidth is live video being generated by the increasing number of vidcams on the battlefield. These vids are being exchanged by the units cooperating in an operation, be it combat or peacekeeping. This huge demand for in bandwidth began in the 1990s, when the U.S. armed forces moved to satellite communications in a big way. This made sense, especially where troops often have to quickly set up shop in out of the way places and need a reliable way to keep in touch with nearby forces on land and sea, as well as bases and headquarters back in the United States. At the time of the 1991 Gulf War there was enough satellite bandwidth in the Persian Gulf for about 1,300 simultaneous phone calls (12 megabits per second). Britain and the US will stage a war-game later this year, simulating a cyber attack on a nuclear power plant, to test the readiness of the government and utility firms. As David Cameron prepares to fly to Washington to attend a nuclear security summit, convened by Barack Obama, government sources said the two countries plan to cooperate on exploring the resilience of nuclear infrastructure to a terrorist attack. The approach will echo a similar exercise last year, which tested how the major banks could withstand a cyber-security attack. Separately, Cameron is also set to announce an exchange deal with the US, which will see the UK ship 700kg (110st) of nuclear waste, most of it currently stored at Dounreay, in Scotland, to be processed in America. In June of 2015, a small software and security programming outfit called eQualit.ie received $473,738 in funding from the Canadian government "to deliver digital security training and software to human rights defenders and activists in Ukraine." Last month, the fruits of its labor — a program called Deflect DDoS mitigation — was put to the test, right in the thick of the tense situation still unfolding in Eastern Ukraine. The Canadian-funded software successfully defended a Ukrainian news site from outside attackers, serving as a proof of concept that the small-scale, open-source, community-based can ward off clouds of malicious machines. Cyber-defense in Ukraine has become especially relevant, as hackers target critical infrastructure and independent news media. Last December, hackers successfully took down a Ukrainian power plant, knocking out electricity in parts of the country. "It also feels to us that the many internal Ukrainian conflicts — fighting corruption a telling example — often result in aggression against the website." eQualit.ie hopes that Deflect can work as a shield against those sorts of attacks, which range from small, cheap, and unsophisticated efforts to knock out websites to large, expensive, and incredibly complicated plans to take out important state assets. The Department of Defense (DoD) announced today that interested participants may now register to compete in the “Hack the Pentagon” pilot. The pilot, designed to identify and resolve security vulnerabilities within DoD websites through crowdsourcing, is the first bug bounty program in the history of the federal government. DoD is partnering with HackerOne, a reputable Bug Bounty-as-a-service firm based out of Silicon Valley, to run the Hack the Pentagon pilot over the next several weeks. The Hack the Pentagon bug bounty pilot will start on Monday, April 18 and end by Thursday, May 12. Qualifying bounties will be issued by HackerOne no later than Friday, June 10. The program will target several DoD public websites which will be identified to the participants as the beginning of the challenge approaches. Critical, mission-facing computer systems will not be involved in the program. HackerOne has set up a registration site for eligible participants. Eligible participants must be a U.S. person, and must not be on the U.S. Department of Treasury’s Specially Designated Nationals list, a list of people and organizations engaged in terrorism, drug trafficking and other crimes; U.S. citizens and companies are prohibited from doing business with listed entities. In addition, successful participants who submit qualifying vulnerability reports will undergo a basic criminal background screening to ensure taxpayer dollars are spent wisely. Screening details will be communicated in advance to participants, and participants will have the ability to opt-out of any screening, but will forgo bounty compensation. A report by a Washington D.C. think tank warns of a dangerous future for U.S. ground troops in which they must defend themselves against swarms of flying attack drones, each packing the explosive power of an artillery shell. The report, entitled “Uncertain Ground: Emerging Challenges in Land Warfare”, was published by the Center for New American Security. The author, Paul Scharre, is a former Army Ranger with multiple tours in Iraq and Afghanistan. Read the report here [PDF]. Options for defending against these drones are limited. Small and fast, drones are difficult to shoot out of the sky. GPS-guided drones can be jammed, but other drones that use line of sight control or inertial guidance would still get through. 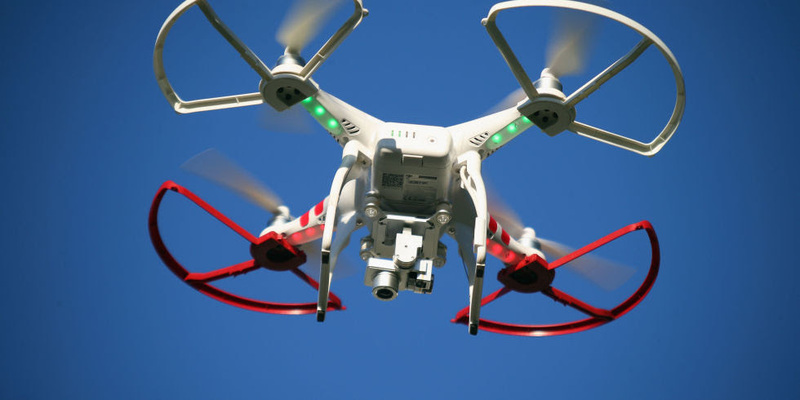 Because drones are relatively cheap, an attacker could simply add more of them to overcome a defense, mounting swarming attacks from multiple directions.